In need of a gift idea for that special traveler? 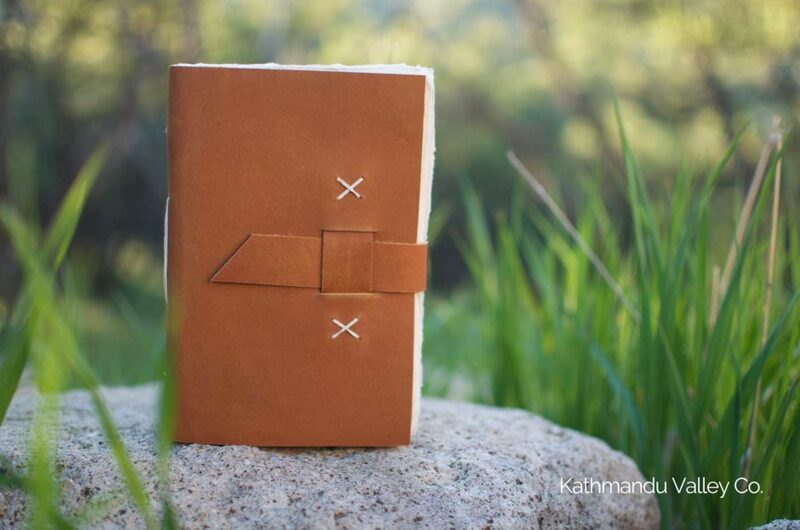 Perfect for the adventurer, hiker, camper, the Nepali Traveler Journal is made with water buffalo leather, vegetable-dyed with mimosa bark giving it that beautiful caramel color. The paper is handmade in the Himalayas and comes from a non-tree source, the Lokta bush. When cut, the Lokta bushes regrow new shoots, reaching maturity in about five years making it a sustainable resource. The inner fibers of the lokta bush are cooked into a mash and then hand-applied to boxed screens and set to dry in the himalayan sun. This process forms the paper, leaving a beautiful texture on the paper from this natural process. The paper is carried down through the mountain passes of Nepal by donkey eventually reaching the capital of Kathmandu where it is crafted into our journals. Whether for your outdoor adventurer or reflective journal keeper, the Nepali Traveler Vintage Journal makes a great gift.